Radiation from the Fukushima nuclear disaster reached Canada's west coast last June, up to two years earlier than scientific models predicted. Radiation from Japan's Fukushima nuclear disaster reached Canada's west coast last June, far earlier than expected. Researchers from the Department of Fisheries and Oceans Canada had been looking for the radiation signal in water as far out as 1,500 kilometres west of Vancouver since the disaster in 2011. They finally detected the signal in June 2013, the researchers announced at the American Geophysical Union's Ocean Sciences Meeting in Hawaii this week. John Smith, a chemical oceanographer at the fisheries department's Bedford Institute of Oceanography in Dartmouth, N.S., who co-authored the report, noted that the radiation levels detected were "extremely low" – far lower than allowable levels in drinking water. "There's no human health or environmental radiological concerns," he said in an interview with CBC News Halifax. 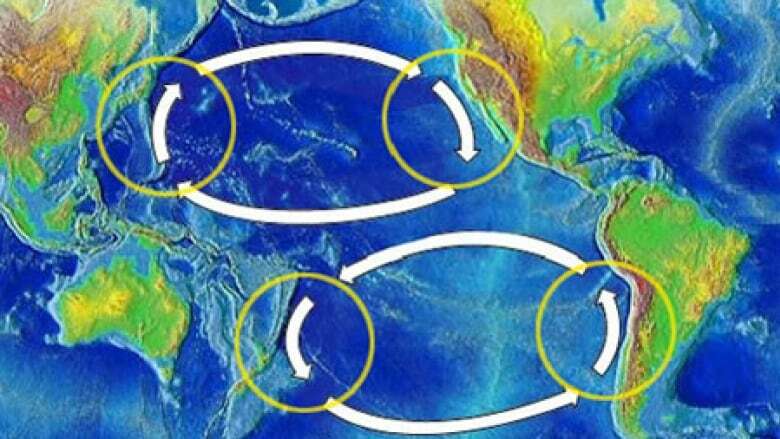 Interestingly, the signal arrived far earlier than predicted by scientific models of ocean currents — two years earlier in the case of one model. Smith said he thinks that may be because the radioactivity released by Fukushima wasn't just discharged straight into the ocean. Some was blown up into the atmosphere and was carried east before falling into the ocean ahead of the "plume" released straight into the water. "In other words, it gave the plume a bit of head start across the Pacific," said Smith, a chemical oceanographer who specializes in tracking water circulation in the ocean. The Fukushima Daiichi nuclear plant suffered multiple meltdowns following a massive earthquake and tsunami in March 2011. Radiation began seeping from the plant when the magnitude 9 earthquake and a tsunami on March 11 knocked out its cooling systems. It was a Level 7 "major accident" and the worst since the nuclear disaster in Chernobyl, Ukraine, in 1986. The accident released two types of radioactive cesium, one of which decays quickly – after two years, only half of the original amount is left, and after four years, just a quarter remains. Because of that, cesium-134 from other sources, such as nuclear tests decades ago, is long gone. "The only cesium-134 in the ocean is from Fukushima," Smith said. Because of that, researchers looked specifically for the cesium-134 signal on the west coast of North America. Smith said the Fukushima radiation was expected to split off the coast of B.C., with part of it moving north toward Alaska and part of it moving south toward California before "it will eventually all mix up and smear out in the eastern North Pacific." So far, U.S. researchers say they haven't detected any cesium-134 in Washington, California or Hawaii, reported LiveScience from the meeting. However, some radiation was reported detected in Alaska last November. Smith will continue to analyze the data he has received and monitor Canadian waters for any sign of increasing radiation.